Bohemian and free-spirited, the Brooklyn features a strapless sweetheart neckline, low open back and the signature Anna Campbell silk bow. An ivory lace detail at the tip of the train adds an unexpected and unique finishing touch. Style with detachable, off-the-shoulder silk tulle sleeves for a different reception and ceremony look. All Brooklyn dresses feature vintage inspired guipure lace, a 100% Silk Dupion bust, and 100% Silk Satin skirt lining (with the exception of the Summer Silk Chiffon Skirt and Fitted Silk Crepe De Chine Skirt options which feature a power mesh lining). 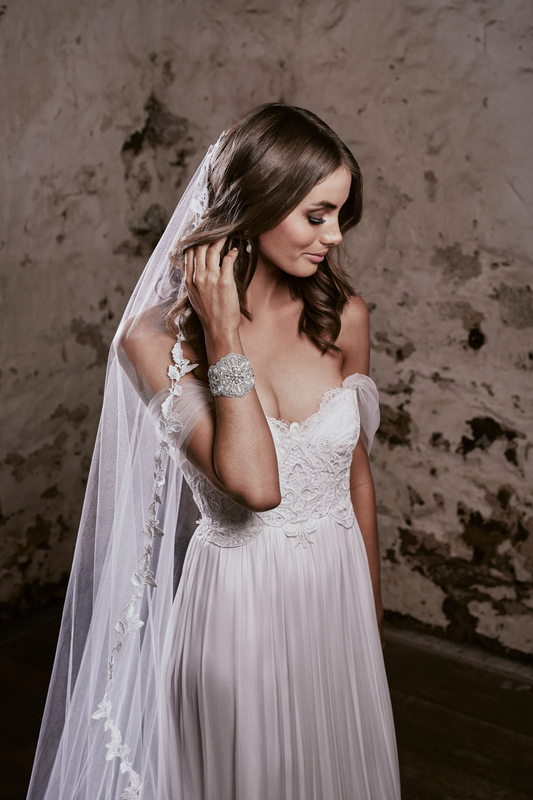 Customisable just for you, the Brooklyn has multiple skirt options available: Brocade Silk Chiffon, Silk Organza, Silk Tulle, Slim Line Lace, Slim Line Silk Chiffon and Trumpet Lace. Sweetheart bodice with soft boning provides shape. All skirt options come with a modern, in-built train, easily bustled with a silk-covered button.